Alpine Park Riverside Cottages are the only absolute water front self contained accommodation cottages in Bright - Porepunkah. Book your Alpine accommodation online today! Two pet friendly units available. Rolling lawns to the water's edge of the Ovens River, in a beautiful parkland setting make this a fantastic property for relaxing and unwinding. 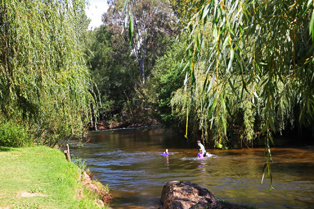 Swim in the river during summer and ski the slopes in winter, Alpine Park Riverside Cottages has it all, your only Alpine riverfront accommodation in the Bright | Porepunkah region. Swings and plenty of lawned play areas for the kids or experience the privacy the waterside studios afford to couples. Cottage blocks set well apart by lush gardens separate the different cottage configuration styles. Just 8 kilometres from Bright these self catering accommodation cottages are perfect for your holiday accommodation. 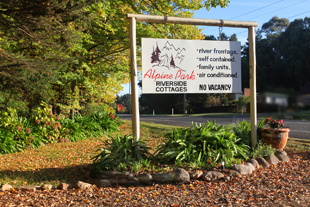 Alpine Park Riverside Cottages is a designated NON-SMOKING property. Plenty to do for young and old, walk to the wineries over the road in Porepunkah sample some of the fruits of their labour and enjoy. New ownership, by experienced awarding winning owners, has seen Alpine Park Riverside Cottages being upgraded. This outstanding facility now has new flat screen TV’s & new DVD players amongst other numerous improvements. The BBQ’s are set in the lush garden surrounds with ample seating scattered throughout the property afford a few of the niceties of life. The only and best riverfront accommodation in Bright, Victoria's High Country. Nearby restaurants in Bright, too numerous, to mention will tantalise your taste buds. All these ingredients will have you coming back time after time. Go on why don’t indulge in our self contained holiday cottage accommodation, treat yourself; you deserve it and yes, we have two dog friendly units for small animal lovers. Conditions and a small charge applies. Alpine Park is only a short stroll to Feathertop and Ringer Reef Winery.